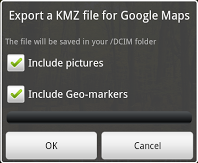 KMZ archives are files used by Google Earth (more info) and contain your pictures and Geo-Markers. 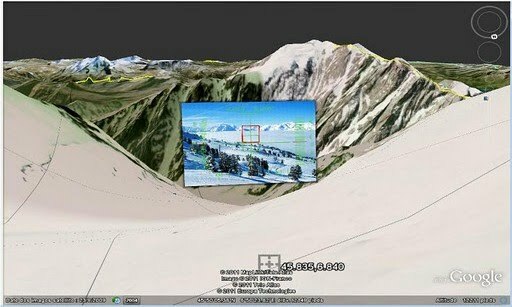 They can be exported from GeoCam Pro and seen on any device running Google Earth (ie any computer where it is installed). Select what you want to include in this archive, pictures, markers, or both, and click ok. After a short processing time, you get a message saying "KMZ exported". Firstly, connect your device to your PC with the USB cable. Make sure it is in "Mass storage" mode, and use your computer to browse to its "Downloads" directory (note that there can be different Downloads folders for example if you have both internal and external memory). From there you can see KMZ archives, as well as some pictures. If you sort them by type and by name, you will easily be able to find your exported files with the .kmz extension. The last one you exported should be at the bottom of this list. 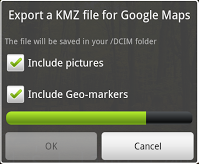 If the KMZ format is associated with Google Earh on your computer, double click on the file. Otherwise start Google Earth, then do File > Open and select your KMZ file. Your pictures and markers are loaded, and you can see them in the software.